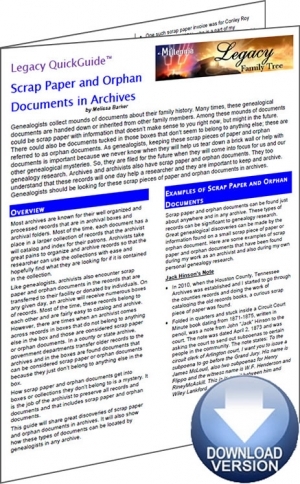 The�Scrap Paper and Orphan Documents in Archives�Legacy QuickGuide™ contains useful information including case studies and success stories using these types of records as well as how to locate scrap paper and orphan documents at archives and repositories. Also included are links to websites and resources covering terminology, resources, books, articles and more. This handy 4-page PDF guide can be used on your computer or mobile device for anytime access.